LulaKate is a longtime favorite of the Southern Weddings gals–we’ve featured their “classic with a twist” bridesmaid dresses more times than we can count (find them in our editorials here, here, and here), as well as had the privilege of rocking a few LulaKate styles ourselves at the V6 launch party. Their booth is also a favorite stop any time we head to Bridal Market–there’s nothing better than a little dose of Charleston hospitality in the middle of NYC! Since LulaKate just launched a gorgeous new website and plenty of new styles and fabrics, we thought it would be the perfect time for a little re-introduction. Designer Katherine McDonald kindly answered a few of our questions about this beloved brand, and Kat Harris provided plenty of fun photos that totally capture the vibe of the LulaKate girl. Enjoy! Tell us about the beginnings of LulaKate—why did you want to start a bridesmaid line, and how did you get started? My bridesmaid line evolved from my original ready-to-wear line. Some of my ready-to-wear customers were asking me to design their bridesmaid and wedding dresses, and after saying no a number of times, I finally said yes. After the first wedding, I was hooked. I love the process of getting to know a bride, her family, and her friends. Being part of such a special day in someone’s life is truly an honor. What sets LulaKate apart from other bridesmaid brands? We are proudly sewn in the USA and have some of the best customer service in the industry. What is your single best tip for a bride about to start shopping for her wedding gown? Remember to purchase the dress you love. Consider loved ones’ opinions, but make the final decision yourself. What is your current favorite wedding dress in your collection? If you were to get married tomorrow, which dress would you wear? The Brooklyn is my favorite dress from the 2016 Collection. I would wear either her or the LaMour from the 2014 collection. What is your favorite memory from your own wedding day? My dad playing the drums with the band! Do you have a favorite LulaKate memory? Seeing Carolina Herrera on the street of NYC earlier this year and the first time I went to India in the early years of my career. What is the single greatest lesson you’ve learned in business? Never take anything for granted. Name three items every gal should have in her closet. Something from your mom, something from your grandmother, and something you can pass down to your daughter/daughter-in-law. This post is brought to you by LulaKate – thanks for your support of the brands that make Southern Weddings possible! As y’all may remember from our outfits at the V6 launch party and a number of editorials over the years, we are huge fans of LulaKate here at Southern Weddings, which is why we were completely thrilled to learn that the talented lady behind some of our favorite bridesmaid dresses officially launched a bridal line last year. Kate McDonald Bridal effortlessly blends the chic, flirty vibe we love from LulaKate with a feel of timeless elegance that is perfect for Southern brides. Katherine McDonald kindly answered a few questions we had about her new line, and we are tickled pink to share her answers, as well as a few of our favorite Kate McDonald Bridal designs! Tell us about the beginnings of Kate McDonald. Why did you want to start a bridal line, and how did you get started? My bridal line was an evolution of my bridesmaid line, which evolved from the ready-to-wear line. Bridal is my favorite of all three. I love working with the delicate and intricate fabrics. I never intended to have a bridal line, but then, some of my ready-to-wear customers asked me to design their wedding dresses. After saying no a number of times, I finally said yes. After the first dress, I was hooked I love the process of getting to know a bride and her family, and being part of such a special day. 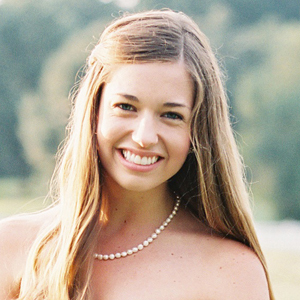 What sets Kate McDonald apart from other bridal gown brands? We are proudly sewn in the USA and have some of the best customer service in the industry. We are also able to customize our gowns for our brides to give them a truly unique style. What is your single best tip for a bride about to start shopping for her wedding gown? Remember to purchase the dress you love. Consider your loved ones’ opinions, but make the final decision yourself. What is your current favorite wedding dress in your collection? If you were to get married tomorrow, which dress would you wear? Waring is my favorite dress from the 2015 Collection. I would wear either her or LaMour, from last year’s collection. This post is brought to you by Kate McDonald Bridal – thanks for your support of the brands that make Southern Weddings possible!